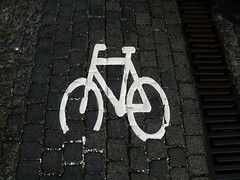 A friendly sign reading "Left Turn for cyclists. Please use the button on the opposite side of the pole". 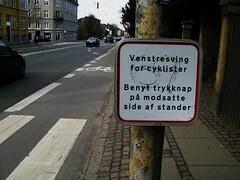 Pressing the button changes the traffic lights so bikes can turn left at this t-intersection. 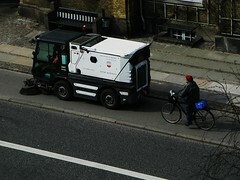 Another bike lane street sweeper and an elderly Copenhagner playing keirin. 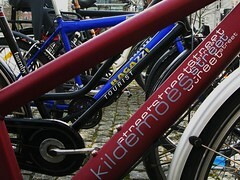 So many bike brands have names appropriate to the way we use our bikes in Copenhagen. There are so many called "Shopping" or "Marcado" or "street"this or "city"that. Or the retrostyle "tourist" theme. Lingering at the back like a dodgy aroma is a Ragazzi - probably leftover from the mid 90's when mountain bikes were popular for about three and a half months. For some reason the market was flooded with cheap Italian mountain bikes. Another example of bikes as adverts for companies. 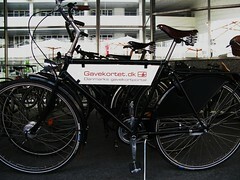 In this case a bespoke Velorbis Churchill with an advert for Gavekortet.dk, a company that sells gift certificates which can be cashed in a wide variety of shops and services.